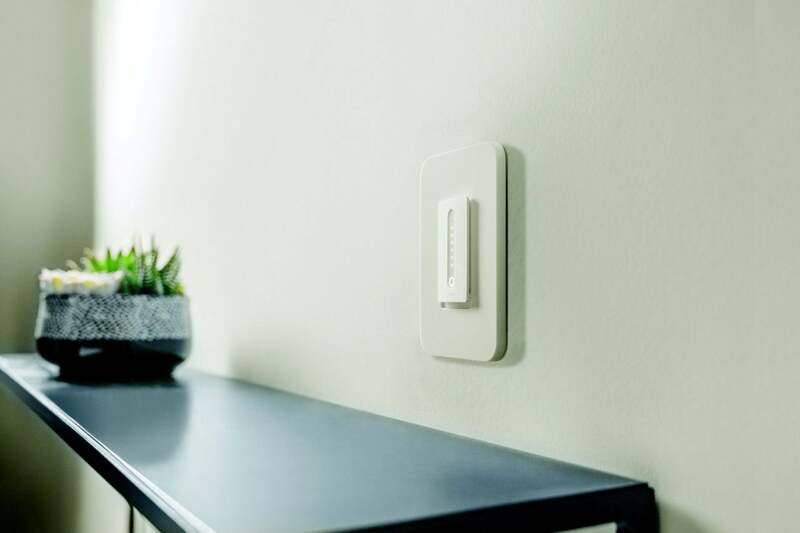 This in-wall dimmer switch gives your room an instant upgrade. Is the Wemo Wi-Fi Smart Dimmer the smartest light switch of all time? If you’re handy with a screwdriver and some basic wiring, it’s an easy winner in the dizzying world of the smart home. Fear not the spaghetti bowl; it’s all less complicated than you’d imagine (as long as you have a neutral wire). The Wemo Wi-Fi Smart Dimmer is an upgrade to the venerable Wemo Light Switch, but it does more than just add a dimmer to the package. More on these advanced features later, because if you want to use the Wemo Dimmer, as with the standard Wemo switch, you must first wire it into your wall. The part of the switch that fits inside the wall is quite bulky, much like any in-wall dimmer, so be prepared to use some muscle and creativity to get it into place. That aside, the design of the switch is handy—you use wire nuts instead of screws on the back or sides of the switch to connect it to your house wiring—but it does take a little knowhow and attention to detail to get the job done. Four wires run out the back: two for load and line, one for the ground, and a fourth neutral wire that must be connected as well. Some older homes aren’t wired with a neutral wire. If you don’t find one inside the junction box, you won’t be able to install the Wemo dimmer at all. 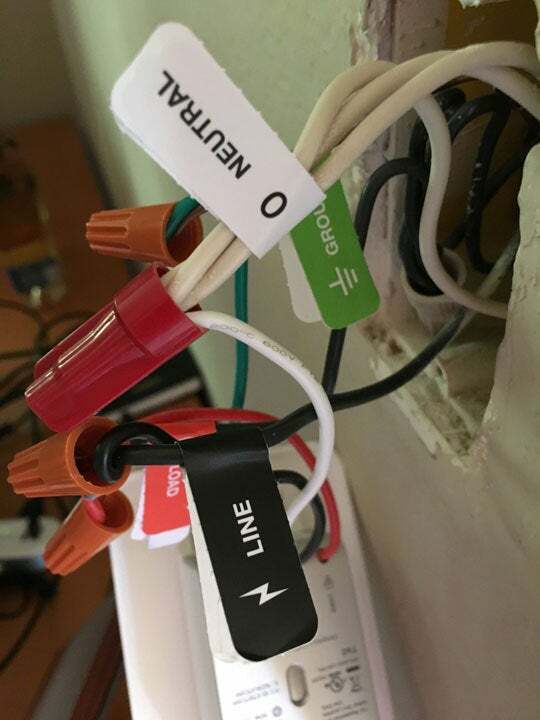 Fortunately, my house had a neutral line, and I had the dimmer installed in about 20 minutes, the only hiccup being that I reversed the load and line wires in my original connections (because the switch I was replacing hadn’t been labeled). Wemo is prepared for this common mistake, and its quick-start guide will alert you of the error before you get too far along in the process. After getting the switch securely in the wall, I spent another 10 minutes installing the app and configuring the switch to access my Wi-Fi network, after which it performed flawlessly throughout my testing. A string of vertical lights indicate the current brightness level of the switch. Front and center is the dimming system. The app walks you through optimizing power levels and dimming speed based on the type of bulbs you have installed, and dimming is smooth and effective whether you’re doing it through the app or through the touch-sensitive panel on the front of the switch. The Wemo Dimmer has gobs of features, especially in comparison to Leviton’s Decora Smart Wi-Fi switch. Just about anything you can imagine doing with a light bulb can be done through the Wemo app. 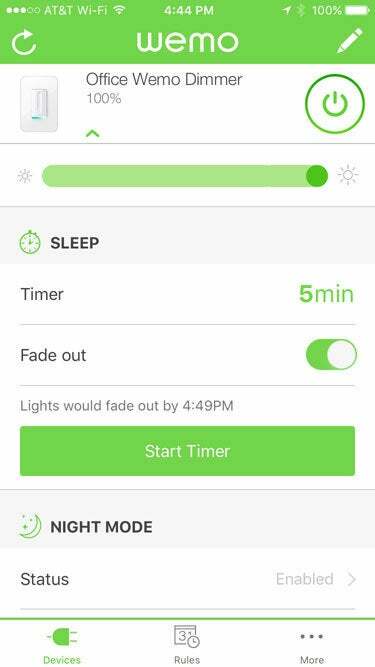 A sleep timer lets you turn the light off automatically, and a scheduling system lets you automate the lights by time and day (or sync with sunrise and sunset). Night mode lets you set it to automatically dim to a brightness you specify at certain hours. The Wemo app lets you establish lighting schedules, control other Wemo devices, and more. If you have additional Wemo devices, you can set them up to work in tandem with the Dimmer, by setting up a “long press” rule in the app. This can be quite handy if you have additional lights in a room that aren’t connected to the wall switch. A long press can turn on the overhead light, and also control the two lamps in opposite corners—provided they’re connected to Wemo smart plugs. Want to connect to other devices? 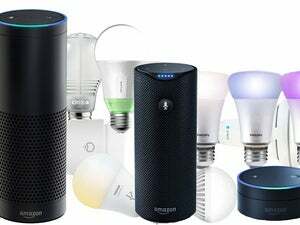 The Dimmer supports Nest, Alexa, Google Assistant, and IFTTT. Because it’s a Wi-Fi device, you don’t need a smart home hub to make any of these connections work. I set it up with an Alexa skill in minutes, and was quickly able to dim the lights by voice command. Compatibility with Apple's HomeKit ecosystem is noticeably absent here, but Belkin says it's working on it. Belkin now has a HomeKit bridge that enables Wemo devices to work with its smart home platform. At a heady $80, the Wemo Dimmer isn’t going to be a low-budget upgrade to your home. That’s more expensive than a smart light bulb, and it’s probably pricier than your ceiling light fixture. But the device works perfectly, and the switch’s thoughtful extras—like multi-device control and broad smart home integration capabilities—add to its overall value proposition.